Working from home can be a wonderful thing: not having to commute, being able to get up in the morning and walk straight into your office, having that flexibility on time and not having to worry about rent on an external office space. If you are concerned you do not have the room in your house for an office, Garden Offices are becoming an increasingly popular option. 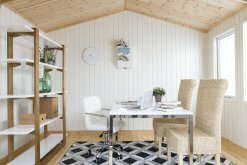 Our garden offices can be designed around what you need to be as productive as possible, but also to match your perfect style. So what is your perfect style - Minimalist? Traditional? Modern? White is the go-to colour for a minimalist style office. Ideal additions include hidden shelves, a glass desk and a few no fuss chairs. If you want to make a real statement, monochrome detailing makes a bold impact. A few hints of black can make all the difference. The golden rule here is that less is certainly more. Taking inspiration from creative offices and fledgling start-ups, modern design is your chance to have fun whilst still keeping things appropriate for a work space. Modern design often utilises sleek lines and curves, quirky furniture and bean bags, as well as pops of bright colour. However, this is your office so feel free to break and bend the rules how you wish! Designing your office in a more traditional style normally includes lots of antique wooden furniture. Dark browns, or a combination of pale and dark brown wood, will work really well. Large, high backed chairs and antiquated trinkets like a globe and some old, dusty books will finish off your traditional design to great effect. Be creative with your storage in smaller spaces, so that your office doesn’t feel cluttered: a cluttered office will not yield a productive atmosphere. The final word in productivity comes from what you actually put in your office. Make sure everything in your office has a purpose. Before putting something in there, ask yourself, do I need this to work effectively? If the answer is no, chances are you don’t need it. Many of our buildings work very well as a garden office. For example, our Salthouse and Burnham Studios would suit a modern or minimalist design with their full-length glass windows and doors. Our Garden Room or Holkham Summerhouse would both suit a more traditional internal design. The Holkham Summerhouse is also very light and airy, this is great as no-one wants to work somewhere stuffy and closed-in. At Crane Garden Buildings, we hand-craft our buildings to meet your needs. We also deliver and install them for free as part of our end-to-end quality service. If you tell us you want to use this Garden Building as a workspace, we will tailor your design accordingly. Why not get inspired by visiting one of our seven UK Show Centres? Alternatively, you can get in touch with the team either via Request a Callback, Contact Us or calling 01760 444 229.